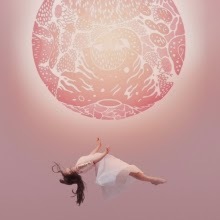 One of the most exciting bands around these days has to be the Edmonton duo Purity Ring. On their sophomore album another eternity the pair manage to combine the best aspects of Austra, My Bloody Valentine, and Sleigh Bells into an absolutely delicious concoction. The record opens with the glorious "heartsigh". Megan James' charming vocals are juxtaposed with rough-edged beats that are straight from Sleigh Bells best work (making it ideal for music fans who feel Sleigh Bells are too harsh). The same formula returns on "flood on the floor", where bursts of aggressive scales seem to come out of nowhere. The cascading arrangement of "bodyache" makes it sound like the intro to a movie dream sequence. The melodic "stronger than earth" is transformed halfway through by the jarring, slashing electronica. The vocals are the star of the show on "push pull" and the slick Austra-like "Dust Hymn". "repetition" is a mellower number, which smolders with a Belinda Butcher-esque delivery. The lone misstep is the album's closing track "stillness is woe". It could have been a lovely intimate way to cap of the LP if it weren't marred by some horrible Autotuning of the vocals. As 2015 goes on, it will likely become clear that another eternity is a solid contender for album of the year honours. Purity Ring play the Field Trip Festival at Fort York on June 6th. Best tracks: "heartsigh", "stronger than earth"